BJ's in McAllen is located in beautiful and tropical McAllen, Texas in the Palm's Shopper Center in front of the McAllen Convention Center. When you're looking for a place in McAllen where you can enjoy amazing food and beer--as well as a great atmosphere--you'll love BJ's Restaurant & Brewhouse, a place that's dedicated to bringing you the absolute best! 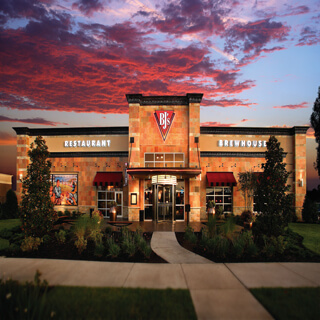 BJ's Restaurant & Brewhouse is home to a menu filled with a variety of delicious items. We have something to suit all kinds of tastes; whether you're in the mood for a Handcrafted Burger, a Garden Fresh Specialty Salad, or something else entirely, you're likely to find it here. We especially recommend our BJ's Signature Deep Dish Pizza, which comes in such tasty varieties as Pepperoni Extreme, Gourmet Five Meat, and Barbeque Chicken. Just be sure that you save room for a delicious Pizookie, our signature dessert item! Of course, it's not just great food that we offer. We have a selection of delicious craft beer that's handcrafted by our team of expert brewers. They work hard to bring you delicious ales and lagers inspired by the many varieties of beer styles from around the world. From our Brewhouse Blonde (a refreshing German Kolsch) to our Tatonka Stout (a dark, powerful Russian Imperial Stout), you're sure to find something that you love. We also have seasonal and limited edition beers, so you can stop by frequently to try something new! From the beer to the food to the great atmosphere--where you can come with a crowd or by yourself and feel equally at home--you'll love BJ's Restaurant & Brewhouse, so stop by our McAllen location today and give us a try! Our team focuses on delivering the best service in the Rio Grande Valley, supported by an outstanding fresh menu that has something for everyone. Not to mention our award winning BJ's beer selection, brewed by us.